February 5th, 2019 - Does My Bomb Look Big In This? 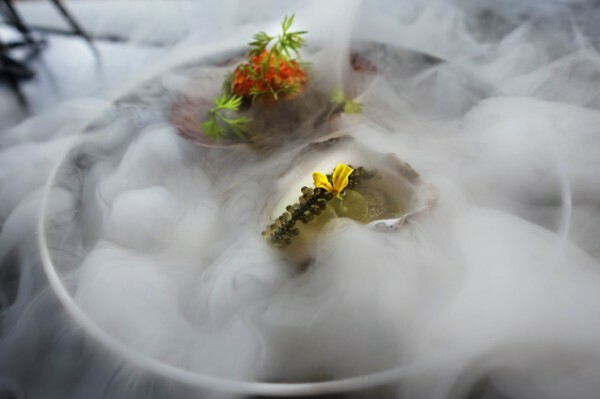 From beneath the shroud of white smoke that has enveloped our whole table, bright toppings on an oyster and ceviche slowly appear. 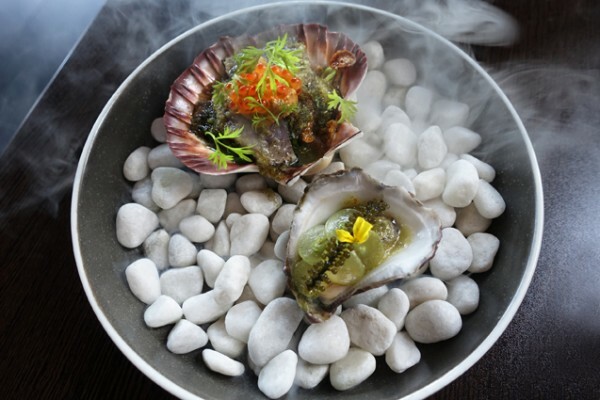 With popping sea grapes, this Sydney Rock Oyster ($5.50/each) plays to the funkier more feral expression of the oyster, then pretties it up with lime, chilli, coriander, eschallot and scales of compressed grape. It was completely by chance that the subtle four-letter signage shift, from Onde to Moon, caught my eye as I drove past the brutalist concrete wedge on Liverpool Street. A cursory glance on Instagram had me booking straight in. I’m even more pleased to report that, in situ, this is one restaurant where the eating lives up to the visual expectations. 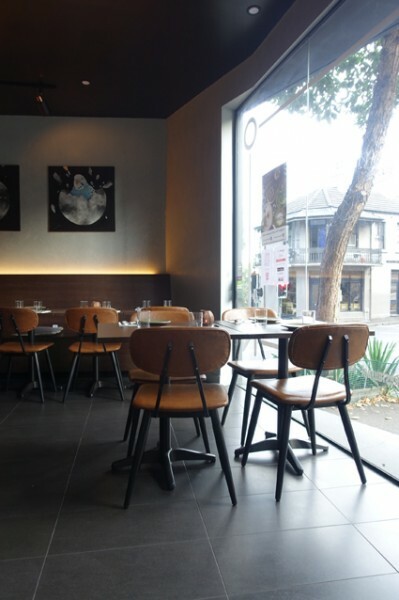 While the glass-fronted dining room is minimalist and a bit bunker-like for my liking, the seating – a mix of wooden banquettes and school room-style chairs – proves comfortable enough. 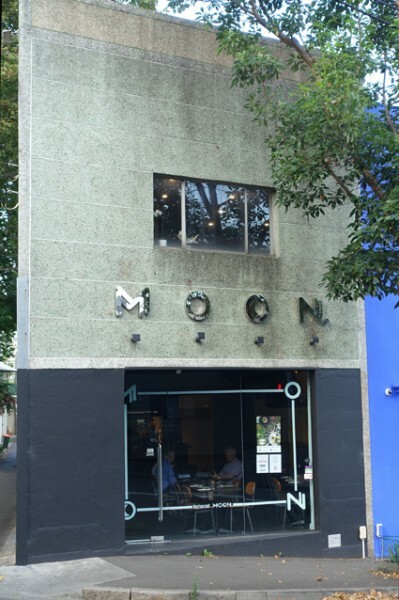 The (somewhat dubious) art and the menu both have lunar leanings, with dishes arranged by size into crescents, half-moons and full moons. Dining as a pair, we stayed with crescents (snacks) and half-moons (entrees) and found the latter to be generously proportioned. 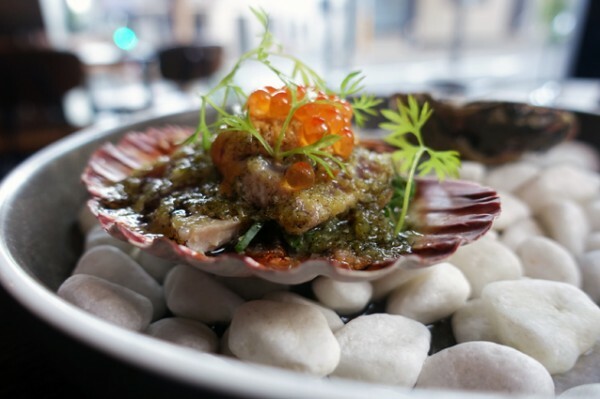 In the kitchen, former Longrain chef, Aum Touchpong Chancaw, is talented and passionate about merging a European sensibility with traditional Thai cuisine. While you might wince at the nine-buck price tag, his Oyster Tempura ($9/each) is like nothing else you've seen. 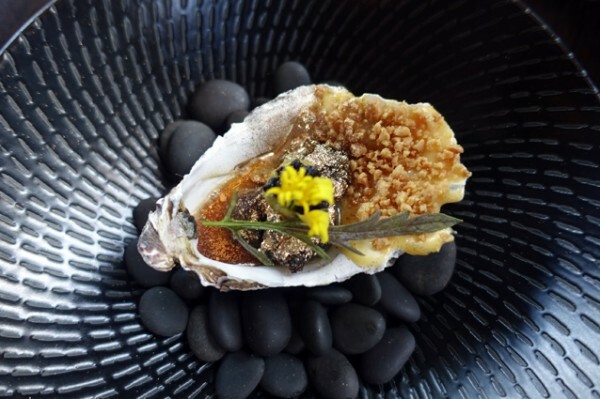 Turned black with ephemeral squid ink batter then enrobed in gleaming gold leaf, the oyster is reverently placed back on its sabayon-painted shell. Drag it out from hiding along the peanutty rubble and pop it onto your tongue for a private moment of Communion. Egg Pancake ($26) updates the Vietnamese banh xeo into a more eye-catching, less soggy dish by making the enfolding pancake into a sail. 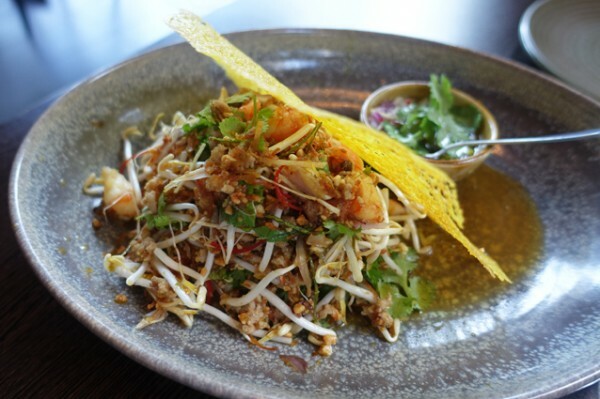 It protrudes from a cold, pork and prawn stir-fry - yeah okay, it isn't quite as imaginative as the oyster, but it's got nice clarity, with caramelised coconut, snapping fresh bean sprouts, and balanced chilli. 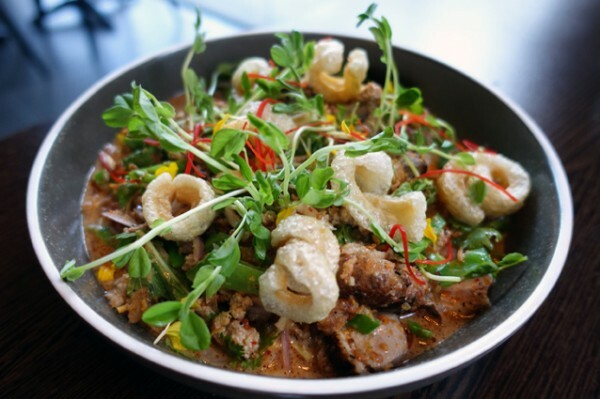 The Charcoal Grilled Duck Breast and Pork Mince Salad ($28) offers livelier chilli, and skin-on duck meat that actually has both flexibility and flavour. It's a vast improvement upon the cold, hard slabs of bland protein I’ve been served elsewhere, with more texture and interest coming from curls of pork crackling and snow pea shoots. Against a little steamed Jasmine Rice ($3/person) and sips of the 2013 Snake & Herring ‘Hallelujah’ Chardonnay ($65/bottle) it’s a satisfying eat. Running from mouth-pursing grapefruit to buttery brioche, the lightly flinty Western Australian Chardonnay is a good cuisine match, plucked from the short and reasonably priced wine list. 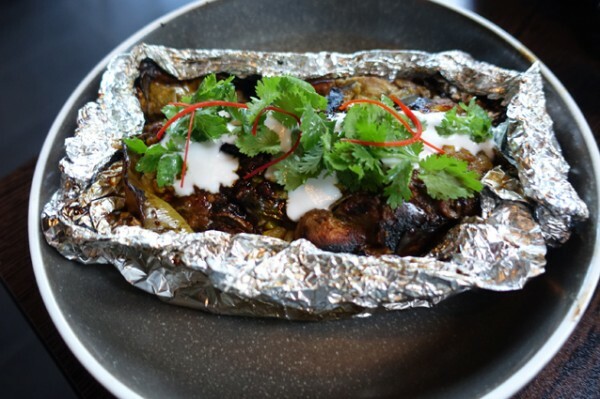 It cuts through the spicy salad but gentles to also accommodate a generous foil package of Grilled Barramundi Fillets ($28). Inside it you'll find plentiful fish cooked inside a banana leaf with a gentle, turmeric-based curry paste, sweet corn, mushrooms, eggplant and basil. 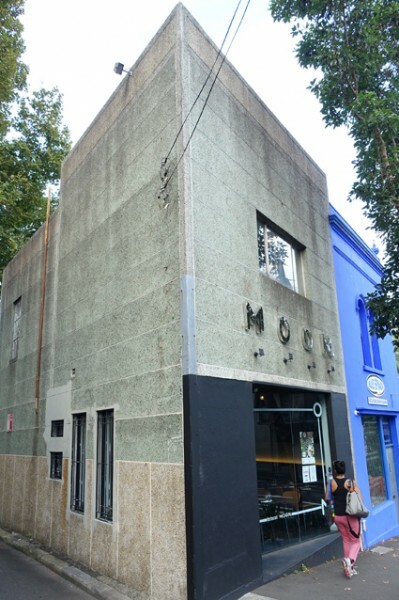 With memories of Darley Street Thai twenty-five years ago in my head, sophisticated, adult tunes in my ears, and a palate that feel alive, I journey over the moon (dessert) to put my palate to bed. 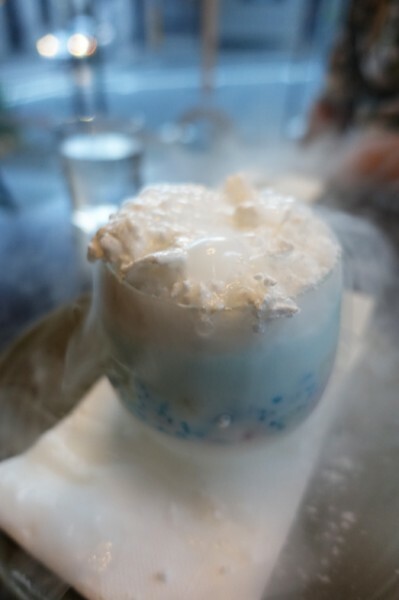 The meal ends the same way it began, veiled in cloud of white smoke, that eventually reveals a Thai Panna Cotta ($14). 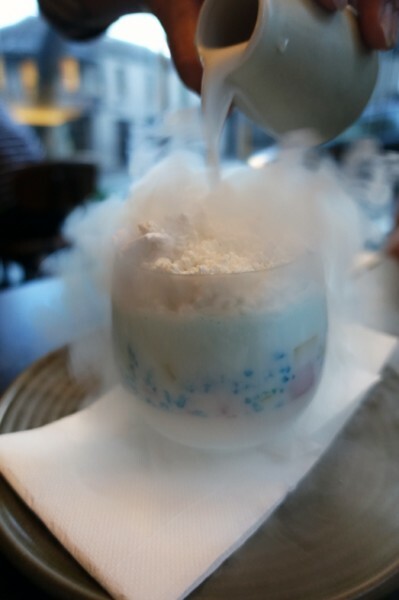 This dessert is a update to the street food pudding I had from a hole in the wall - Chaao Thai Siam - last month. 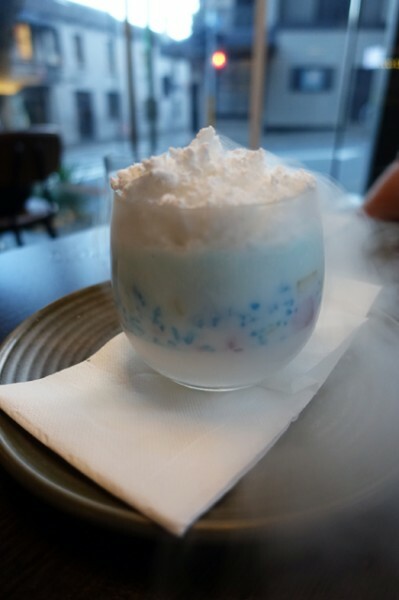 The pudding is made from coconut water, with textural interest from chestnut ruby and umami in the salty coconut cream - basically your Thai trifle with some coconut nitro drama. 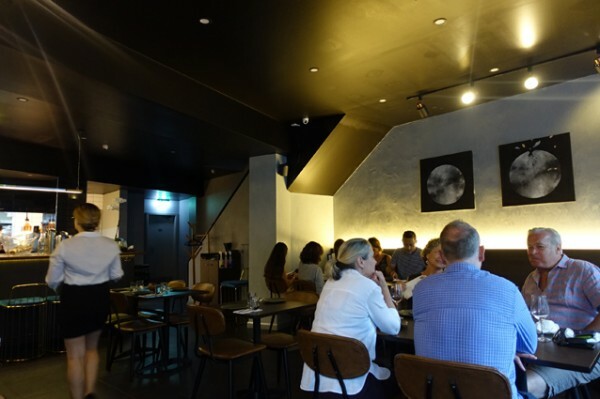 With Thai standards now as familiar as the Aussie-Cantonese you find in every Sydney suburb, I feel like it’s been years since I have been truly excited by Thai food. 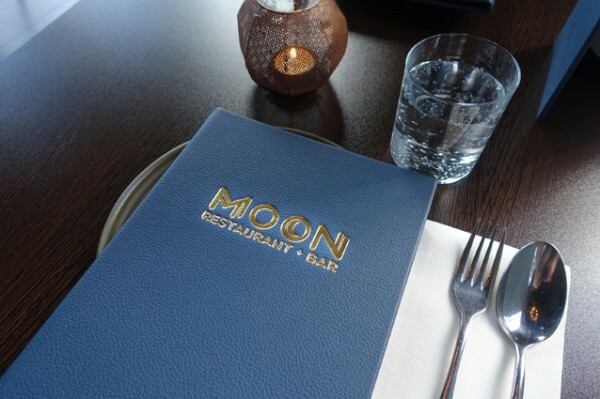 Restaurant Moon has placed innovative Thai eating back on the agenda.